Chinese New Year Embarrassment | stories and etc. 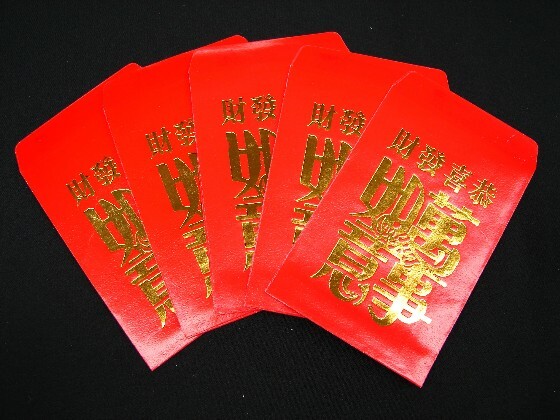 Last week I got some red pocket from some family/relatives for Chinese New Year. It’s a pretty standard tradition and it used to be one of the few ways I got money as a kid (besides beating up other kids for their lunch money…. jk of course…). Every couple of years, my dad reminds me something I did ages ago as a kid. In my defense, I was very young and you don’t always realize how inappropriate your actions are… So here’s what happened. One of my relatives gave me red pocket and I was very excited to receive it (I don’t remember exactly, but I must have gotten lots of red pocket the previous year). Anyways, I was so excited I opened it right in front of them (mistake #1 – never open it at time of receiving.. in fact there are even “rules” that you’re supposed to open it a certain amount of time after CNY). After I opened it, I exclaimed loudly, “TWO BUCKS?!?!”. Yup, I really did that. Greedy AND stupid. My parents were so embarrassed that they have never let me live it down. I bet my relative never forgot about it either. We all laugh about it now of course. But let’s just say, I never did that again. ← Ever been Spirited Away? LOL! I remember doing that too..I think as kids we all ripped open the red packets =P Until we got shouted at enough that we realized it was a no no !